Took a chance on two things we love most ! 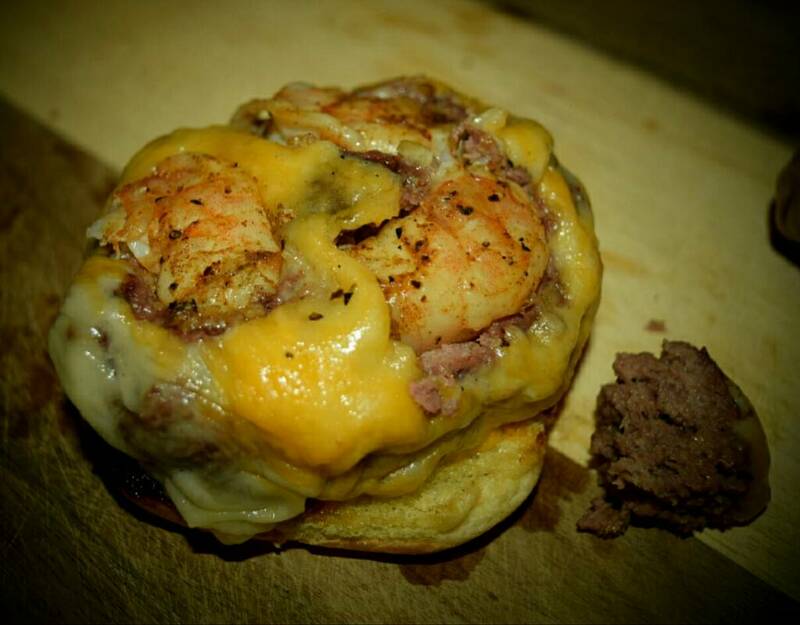 A great Sirloin Burger and Grilled Shrimp and mixed them together. Mixed in some Sucklebusters Steak Seasoning and 1/2 an Egg and Italian Bread crumbs into the Ground Beef. Grilled Some Large Shrimp and dusted them with Season All, Old Bay, Dry Minced Garlic, Salt, Pepper and a little Olive Oil. 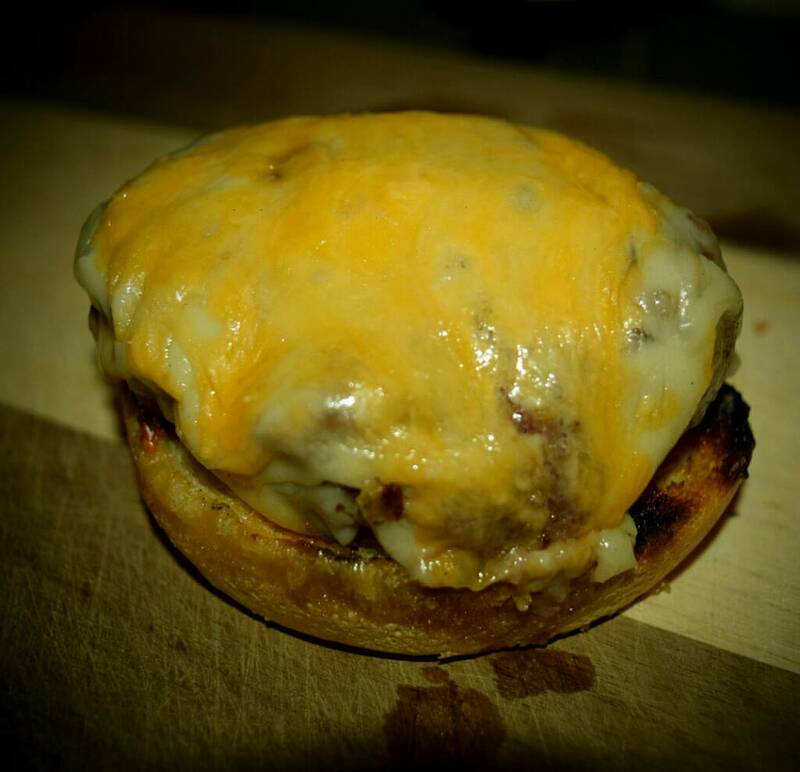 Topped with American, Cheddar and Mexican Cheese Mix. 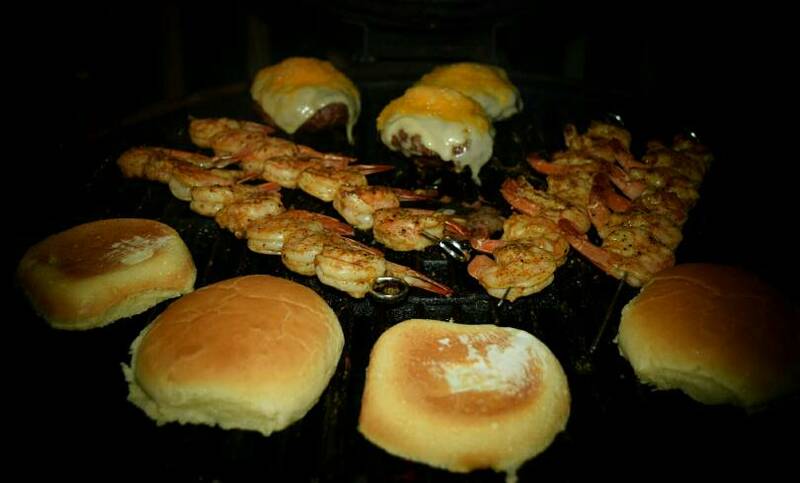 Notched out some spots to hide the Shrimp and on the grill they went. 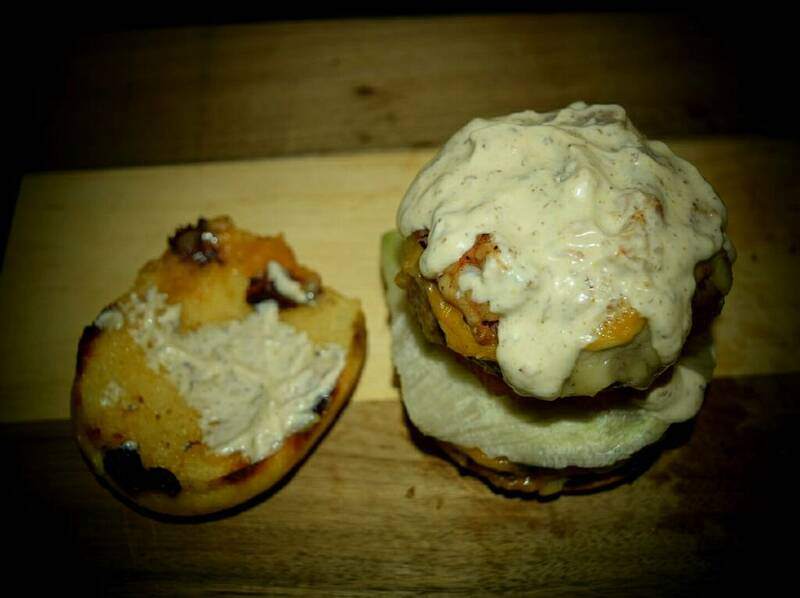 Made our own Home Made Aioli Sauce and Double Stacked them with Lettuce & Tomato. Last edited by woodenvisions on Sat Sep 23, 2017 7:50 pm, edited 1 time in total. Ok, now for the verdict since I now have a free moment. I've never had these two before Incorporated together like this. All I can say is that we've been missing out big time. The Aioli is the key I think that takes it over the top. Unfortunatly WV, you have been placed on my restricted reading list. It has been fun, but every time I open one of your posts I gain a few lbs that I cannot afford. My poor wife asked me what I had been eating out of the ordinary? I had no answer for her, but she busted me this morning looking at your pictures. She said "That's why you are gaining weight, right there" so I guess this is adios. Ok, shes gone now. Not to worry buddy, all ^^^^^^^^^ was for her benefit. You have a faithful follower for life. I doubt I could eat that whole delicious-looking, irresitible thing. Well, I knew we had some big ole honkin pieces of that Apple Bread left from the other night and it was gonna be for our breakfast, so I had to save room for the morning chow and made that entire burger go bye bye lol ! That's one of the funniest things I've ever read on this forum:):):):). Please tell your wife that I'm sincerely sorry and I promise to only post Lettuce,Carrots and Rice Cakes Pics from here on out ok ?? I ALWAYS eat breakfast Before I go on this forum just for that reason, lol. It's all in ur mind lol ! 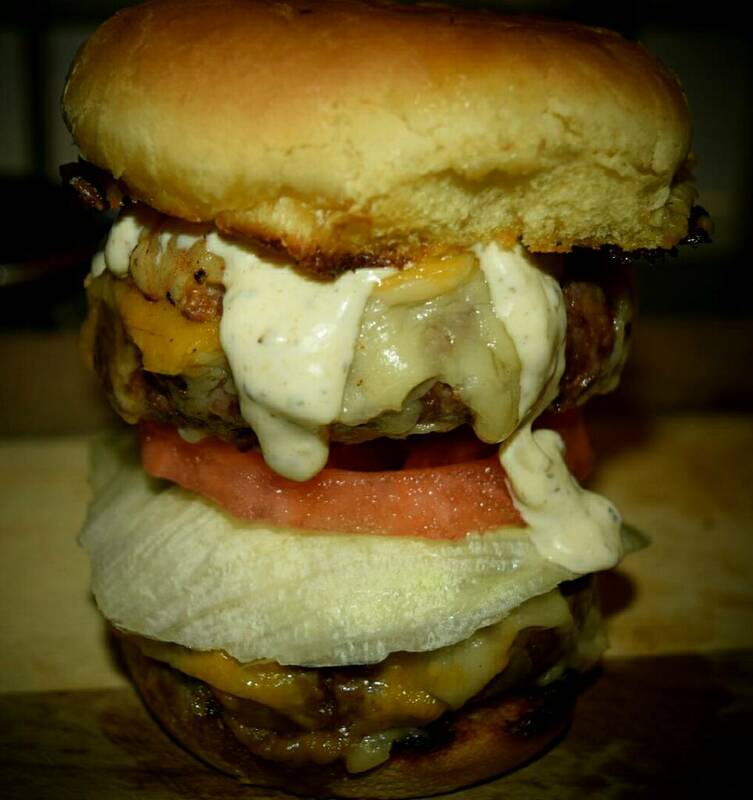 Now THAT'S a burger to be proud of!! Please, just keep on keeping on as always. Yours are always among the first posts I open, even if I know they are detrimental to my health and well being. Lettuce? It has its place, but surely not as one of your masterpieces. Glad you thought it was funny. This forum is fun. Aioli is an addition we use a lot here as well, great with chips, even better with sweet tatter chips. Great burger, I'd call that the works!